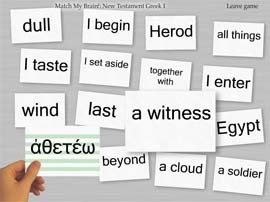 Flash My Brain - Learn modern and ancient Greek with Flash My Brain flash cards. Flash My Brain is shutting down -- export your data or download to FMB On-The-Go. 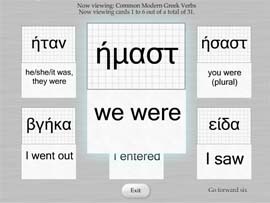 Make Greek learning easier with Flash My Brain flash cards. or select from the 1000s in the library. Flash My Brain has been specifically engineered for flash cards with non-Latin fonts like Greek. 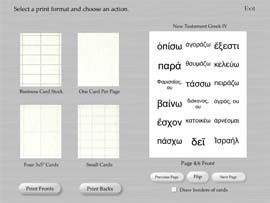 You can print out beautiful Greek flash cards using the print interface shown at the left. 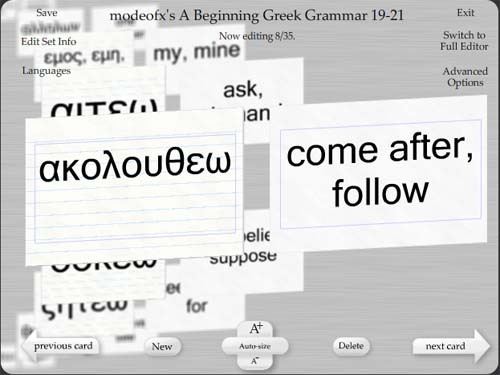 When you buy Flash My Brain, you can look forward to selecting and printing exactly the Greek flash cards you need. Flash My Brain creates and prints beautiful Greek flash cards, but it doesn't stop there. Flash My Brain has an extensive flash card learning module including games and a natural review interface. With Flash My Brain, you can learn online: at home, at school, or at work. Buy Flash My Brain for $29.95 and start using Greek flash cards the Flash My Brain way. Games that help you learn; editors to help you create; an great print function and an environment that encourages personal expression - this is Flash My Brain! Create beautiful flash cards quickly. Print out your flash cards in the way you want. Put them on your iPod, cell phone or PDA. Math flash cards, colorful geography flash cards and Dolch sight word flash cards for students. Five Six! fun flash card games to reinforce your learning. Upload sounds to make flashcards with music and pronunciations. Buy Flash My Brain for $29.95.